I have a great Bialetti professional cookware set I got for Christmas. 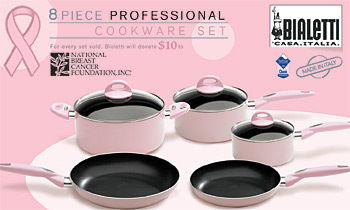 It's an 8 piece, pink, non-stick cookware set from Target. I have had another single skillet from Bialetti for about a year now and love it too. I have never had a problem with the non-stick coming off, the pink doesn't change colors, burn, or melt off. I love the sizes that the set came with, now I have a pot and pan for everything. Most of the cookware comes with a lid. They are very sturdy pots and pans and the bottoms have slight grooved in areas that keep them from slipping off the cook top. I always get even heating and am never disappointed at the way food comes out, the large skillet is great for cooking anything from eggs to pancakes to a medium rare fillet Mignon. The pots are great for boiling things like potatoes or eggs. They always come up to temp quickly without over heating. Even my boyfriend who is self-proclaimed "anti-cute stuff" really enjoys cooking with these skillets. He too thinks they are really nice, I think he just wishes they weren't pink, but that still doesn't seem to stop him. His favorite thing to make is fried eggs and fried potatoes. I like making any kind of steak in them, it always comes out tender and juicy. Join in and write your own page! It's easy to do. How? Simply click here to return to Best Cookware Review.